Who thinks about car maintenance as often as you should? I have to admit, this isn’t one of the things I think about until we’re already well into winter here in Ohio. But this is definitely something that I make sure my husband and I do every year to help keep our cars safe not only for us but for our children. I think about the safety of my children every time I buckle them into the car. 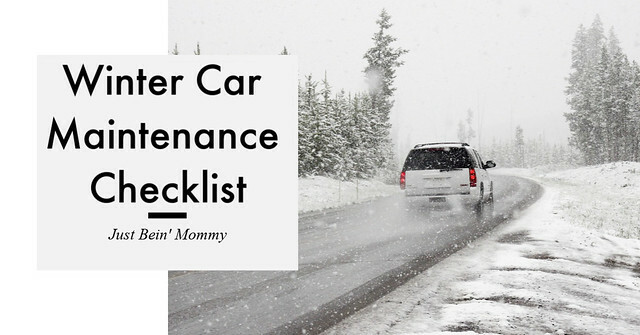 So before we change into the new season, make sure you run through this preventative winter car maintenance checklist. Check tire tread and pressure; replace if necessary. This something you won’t need to do if you have this done every time you get an oil change. However just taking a look at your tires is important anytime.. just in case you have an object stuck in the tire. Check fluid levels (oil, coolant, etc.). These could be low without your knowledge so make sure you aren’t low, this could cause problems for your car if unchecked. Check battery connections and clean off any corrosion. Simple, easy to do. And could save your battery. Also, it doesn’t take a lot of time. Make sure you have a scraper in the car. This is one thing I always have to do because I tend to take mine out in the spring. Mainly because I have children: Everything else needs to fit into the trunk. Or we’re traveling and it’s just in the way. Have a professional inspect the breaks. While you take your car in to get the oil changed, have your breaks checked. Again this might be something that the dealership or repair shop does on its own but if not, have them checked just in case. Have a roadside emergency kit. This may be something that came with the car or something you put together yourself. Either way, it will come in handy. What is something you do to make sure your car is ready for winter? « Long Car rides coming up?